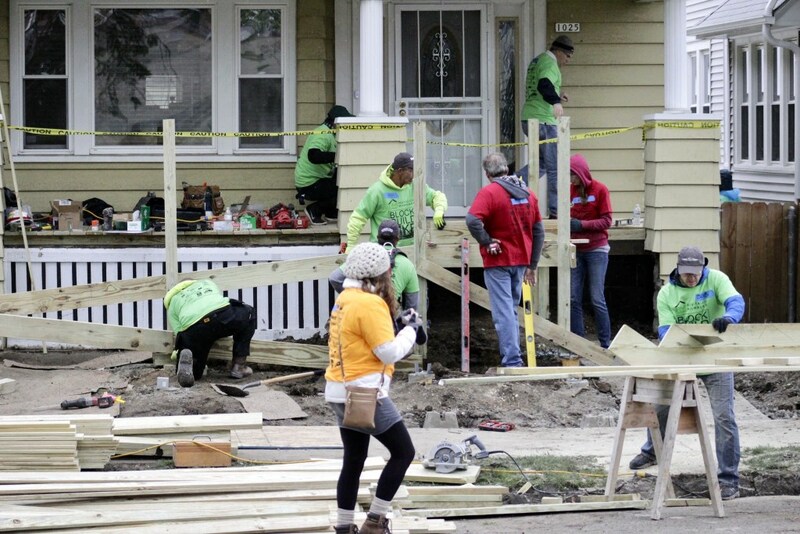 Volunteers build a handicap ramp for a physically challenged Clarke Square resident. Photo by Keith Schubert. Maria Gonzalez bounced back and forth between stirring the Mexican hot chocolate and crushing peppers for the chicken mole for the volunteers helping renovate her house. Gonzalez has lived in her Clarke Square home with her two children for more than 10 years. Without the means to repair her house on her own, she was excited to find out it was chosen to receive major repairs during the second annual Block Build MKE. “People used to sell drugs on the corner, and when the cops would come for them they would run through my backyard, and it ruined my fence,” she said. In addition to installing a new fence and a motion-sensor light, volunteers made minor beautification repairs to Gonzalez’s house. She believes the home improvements will increase her safety. “My house was broken into three times in one month, so hopefully if they see a light they will be scared away,” she said. Two volunteers update a worn-out walkway. Photo by Keith Schubert. 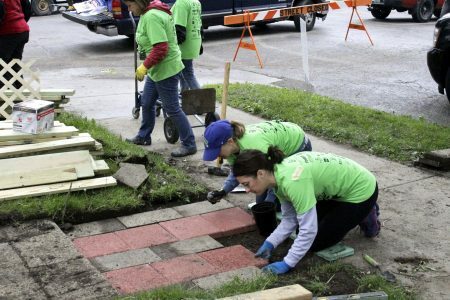 Block Build MKE, an extension of Revitalize Milwaukee, brought together dozens of local sponsors and more than 400 volunteers on a recent weekend. Together, they rehabilitated and revitalized 30 homes on one block in Clarke Square. The homes benefited from everything from yard cleanup and painting, to repairs of plumbing, windows, electrical systems and flooring. For more than 15 years, Revitalize Milwaukee, formerly known as Rebuilding Together Greater Milwaukee, has completed home updates for about 1,700 homes and invested more than $12.5 million in Milwaukee-area housing. “The work we’ve done hand in hand with the community has been life changing for the organization, the volunteers and the homeowners. It has been a great opportunity for people to come to collaboratively make change in the neighborhood,” said Chief Executive Officer Lynnea Katz-Petted. Of the 30 homes, 15 received critical repairs or accessibility modifications. Rhonda Cruz’s home was modified to improve its accessibility. Cruz has lived in Clarke Square with her husband, Ruben Cruz, for more than 30 years. Currently, her daughter and two grandchildren live there as well. Volunteers installed alarms on the windows on the second floor or her house, where her grandson spends most of his time. “My grandson knows how to open the windows up there, and because of his autism, it scares us,” said Cruz. Tracy Johnson volunteered at the event with REACH (Real Estate Alliance for Charity). She said it felt good to work with volunteers in a neighborhood she doesn’t visit often. “I’ve heard about the Clarke Square neighborhood, but after today I have a new appreciation for how much people care about their houses and the neighborhood,” added Johnson, president and CEO of Commercial Real Estate of Realtors Wisconsin.